Framed around the award winning Palace on Wheels luxury train, this tour allows you to enjoy the splendors of ancient and modern India. As soon as you step onboard the train in Delhi, and travel towards the former princely city of Jaipur you can visit palaces, forts and ride on elephants like a maharaja. Then in the “City Of Lakes” Udaipur, you can lunch in a palace hall, before you head to Jaisalmer to bask in the raw beauty of the Thar Desert and ride camel carts. This lovely journey above all else, will allow you to create a indelible memory as you view tigers in the wild, or gaze at the beauty of the Taj Mahal. Wednesday: Join us on a sightseeing tour of Delhi via air-conditioned vehicle beginning at 9:00 a.m.* You may visit sights such as Humayun's Tomb and the impressive Qutub Minar built by Qutub-ud-Din Aibek in 1199 from sandstone and marble. Drive past India Gate (War Memorial Arch), the President's House and Parliament House. Enjoy visits to Birla Temple and Bangla Sahib Gurdwara, the largest Sikh house of worship in Delhi. Later you are dropped off at Safdarjang train station around 4:30 in the afternoon to embark on the journey of a lifetime... a week-long luxury cruise through fascinating Rajasthan on board the Palace on Wheels. *A complimentary hotel pick up within Delhi city limits is provided prior to the sightseeing tour. Thursday: The first stop of Palace on Wheels is Jaipur, one of the most well planned cities of the world in its time. This capital city of Rajasthan, popularly known as the Pink City, was founded by Maharaja Swai Jai Singh II in 1727 A.D. To explore the city, an air-conditioned coach takes you to Hawa Mahal, also known as the Palace of Winds, which is a remarkable five story building along the main street of the old city in pink splendor with semi-octagonal and delicate honeycombed sandstone windows. This is followed by a visit to Amber Fort, eight kms. away, where rides on caparisoned elephants add to the ambiance. Later, you may enjoy shopping for Jaipur’s famous jewelry, handicrafts, carpets, blue pottery and textiles. After lunch at a Palace Hotel, you are off to the City Palace, home of the erstwhile royal family. Right across the road from the City Palace is the Jantar Mantar, the largest observatory built by the Sawai Jai Singh II. The luxury coaches take you back to Palace on Wheels where dinner is served on board. Friday: One can almost sense a life of the wilderness as the Palace on Wheels arrives in Sawai Madhopur, a city named after its founder Maharaja Sawai Madho Singh I. After breakfast, visit the Ranthambore National Park, where the ruins of a 10th century fort are located. This wildlife sanctuary is considered to be the country’s best for observing and photographing the activities of the tiger. The park, covering an area of 392 sq.kms. is also home to more than 300 species of birds. The tiger, hyena, ratel, jackal and fox are among those constituting the carnivorous population here. Sawai Madhopur is known for its exclusive toys, ethnic ornaments and costumes. (Please note that the Ranthambore National Park is closed during the month of September, instead guests will be taken to Mansigh Sanctuary.) 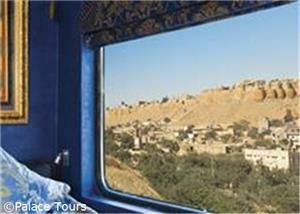 Upon return to the Palace on Wheels, depart for Chittaurgarh, where you have the opportunity to watch the colorful countryside passing by in the daylight. After lunch on board you are in Chittaurgarh. Images of love and valor, scars of battles won and lost, the thrice-beseiged Chittaurgarh Fort is all this and more. Let the legends of honor and pride echo in your mind as you proceed to Udaipur. Saturday: Arrive this morning in Udaipur, the Lake City, which was founded by Maharana Udai Singh of Mewar in 1559 A.D. after the Sisodia dynasty was driven away by the Mughals. Perhaps the two most beautiful sites of Udaipur are the dream-like marble palaces - the Jag Niwas (Lake Palace) and the Jag Mandir, which appear to rise from the blue waters of Lake Pichola. After lunch at one of the fine hotels, take an exhilirating visit to City Palace. 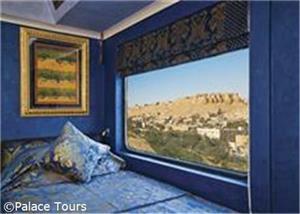 In the evening, visit the crystal gallery and later proceed to Jaisalmer on board Palace on Wheels. Sunday: In the heart of the Thar Desert lies Jaisalmer, founded by Rawal Jaisal in 1156 A.D. Here the yellow sandstone fort is an imposing sight, towering magnificently over the city. Discover the painstakingly latticed havelis or mansions with their grand facades. The Nathmalji-ki-haveli, Patwon-ki-haveli and Salim Singh-ki-haveli are fine examples of the stone carver’s skill. Shop at Rajasthali, the only Rajasthan Govt. Emporium, for fine pattu shawls, mirror work, embroidered articles, wooden boxes, trinkets, silver jewelry and curios. After lunch on board, go for an exciting camel ride on the sand dunes of Sam before sipping a refreshing cup of tea. Enjoy dinner and the cultural programs at a hotel in Jaisalmer before the train leaves tonight for Jodhpur. Monday: This morning, the Palace on Wheels arrives in Jodhpur, a city ringed by a high stone wall with seven gates and several bastions. This second largest city of Rajasthan, founded by Rao Jodha in 1459 A.D. is known for its rock-solid Mehrangarh Fort. The grand palaces within - Moti Mahal, Sheesh Mahal, Phool Mahal, Sileh Khana and Daulat Khana are impressive examples of architectural excellence. Near the fort complex lies Jaswant Thada and a group of royal cenotaphs made of white marble. 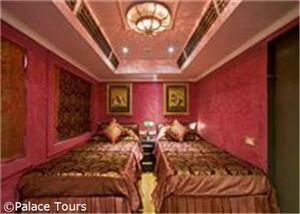 After lunch at a royal Palace hotel, return to the Palace on Wheels. While in Jodhpur, shop for exquisite handcrafted articles including the famous breeches, embroidered shoes, metal curios, silverware, paintings and tie dyed fabrics. Tuesday: Early this morning, the train arrives in Bharatpur, the capital of Maharaja Suraj Mal. After breakfast, pay a visit to the world famous bird sanctuary, Keoladeo Ghana National Park, the nesting place of thousands of egrets, Siberian cranes, migratory water fowl and other species of birds. From Bharatpur you board the train again and arrive at the Taj Mahal, one of the seven wonders of the world. This pristine monument of undying love was built by Emperor Shah Jahan in memory of his beloved queen Mumtaz Mahal. Also visit Agra Fort and see other monuments and tombs about town. Agra is known for its splendid marble inlay work like the Pietra Dura work on the Taj, leather goods and jewelry. 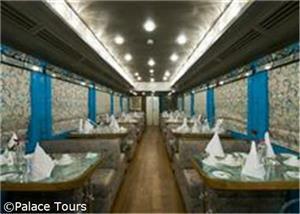 Enjoy dinner on board as the train departs for Delhi. Wednesday: After a good night’s sleep, arrive at the Safdarjang train station at 6:00 a.m. and let the pleasant memories of the past week linger on your mind for a long, long time. Enjoy breakfast on board. Disembark the train by 7:30 a.m. 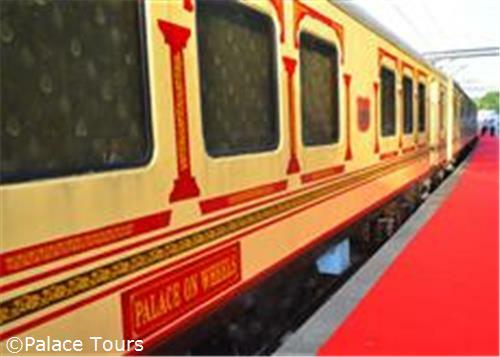 The Palace on Wheels departs every Wednesday, September through April. There are two Presidential Suites (Super Deluxe Suites) on the train that occupy one train carriage. Each cabin has twin beds positioned side by side and can be put together to make a matrimonial style bed. 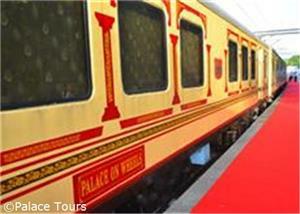 Two restaurants styled after palaces are onboard this train and they are named “The Maharaja" and "The Maharani". Within these restaurants that come with Rajasthani décor you will find Continental, Indian and Chinese dishes created by a chef and his team. In the spa car onboard the train, you can rest and relax after a day of touring palaces and forts. Indian and international liquor is served in the bar onboard the train and each carriage also has a number of books in a library. There are three cabins in each carriage and there is a mini pantry included. Hot and cold beverages are prepared in the pantry and you can rest and relax. Khidmatgars (personal attendants) will be at hand to provide you with any assistance required and fix any beverages you need. In the lounge you can spend your time reading magazines and newspapers. There are also five laptops available onboard the train and you can check with the train manager for details about these if you need to use them. 1Hi, what does double rate and triple rate stands for? We are two adults and two children aged 5 and 6 years. What kind of accomodation is recommended for us? A Double Rate means per person rate for two people in the room on a sharing basis. A Triple rate is for 3 passengers in a room. Triple occupancy can only be accommodated for passengers traveling with children under the age of 12 (2 adults and 1 child - OR - 1 adult and 2 children). For a family of four with young children you will be best accommodated in two double rooms (children pay half price). Side by Side Rooms can be requested. There is no restriction in children sleeping in the same room as parents if the party so desires. You can also choose one triple (with 2 children) and one single room. 2How soon should I book? Our recommendation is to book as soon as you have an idea of when you would be traveling. Lately, the rooms for peak season get sold out 8-10 months before departure, so it will be in your best interest to book early in order to avoid disappointment later. 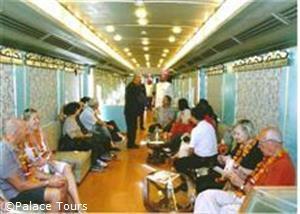 Yes, we maintain a waiting list for the sold out departure dates for the Palace on Wheels. You can add yourself to our waiting list by proceeding to our tour booking engine and clicking on the sold-out departure date that you desire. We recommend you arrive in Delhi one to two days prior to the train's date of departure, depending on your itinerary. This will allow enough time for possible flight delays which are common during the winters (December through February) due to climactic conditions such as snow storms or fog in Delhi. This may also allow you time to rest after your long plane flight and afford you some time for sightseeing in Delhi prior to your train journey. International flights typically reach Delhi late at night or in the very early hours of the morning (i.e. from the USA, you should plan to leave on a Sunday evening, which will bring you to Delhi on Monday night/Tuesday morning). We pick guests up from the hotel at 9:00 AM on the day of the departure and take them to a sight seeing tour of Delhi and then dropoff at the Train Station at about 17:00 Hours. The train is scheduled to arrive in Delhi on the Wednesday following your departure date at 06:00 a.m. Passengers will be offered breakfast on board. You must disembark the train no later than 07:30 a.m. In case the train is delayed due to fog (from December-February), the earliest flight we recommend for leaving Delhi would be in the late afternoon. If you have an entire day before departing Delhi (i.e. for international flights leaving on Wednesday night / Thursday morning), we recommend checking in at a hotel in the city center and spending time at leisure or sightseeing in Delhi and its environs. 6What is the capacity of the train? There are 39 State Rooms on the train and 2 Super Deluxe Suites. They are allocated to single and double occupancies. The number of passengers really depends on the occupancies sold in that departure. There are usually 82 passengers on any fully-booked tour. Rajasthani, Chinese, Continental and American food is served on the train. Fixed menus vary daily. Please notify the chef or train manager of any special orders, dietary restrictions or food allergies. Palace on Wheels provides a non-smoking environment. 9Are there different types of rooms (suites, standard rooms etc.) on board Palace on Wheels? 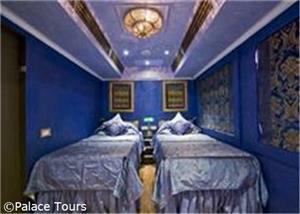 Yes, the Palace on Wheels contains 39 State Rooms and 2 Super Deluxe Suites. Each cabin measures about 9x14 feet and there three cabins (State Rooms) per carriage. The two Presidential Suites (Super Deluxe Suites) occupy one train carriage. Each cabin has twin beds positioned side by side and can be put together to make a matrimonial style bed. All rooms on the Palace on Wheels have attached bathrooms / toilets. Passengers in the room do not share the bathrooms with anyone else. The interior decor changes in the coaches but as far as the rooms are concerned, all single and double occupancy State Rooms are the same size, approximately 9x14 feet, including the closet and private bathroom which measures approximately 4x8 feet. Yes, there are two attendants per carriage meaning two attendants assigned to three cabins. The attendants will be happy to cater to all of your needs. 11What is the weather like? September and April are warm with the temperature ranging between 80-90 degrees Fahrenheit. In October, November, late February and March it is typically 60-80 degrees Fahrenheit. In December and January it is much cooler, between 45-70 degrees Fahrenheit, and you may experience foggy conditions. 12Where is the railway station in Delhi? Will it be busy? The Safdarjang Railway Station is located in south Delhi, near the diplomatic enclave, approximately 30 minutes’ drive from the city center. Please note that the station is not well-equipped for long periods of waiting, so we recommend enjoying other parts of the city prior to your Palace on Wheels boarding time. 13Do I have to stay aboard all seven nights? You are not required to stay aboard the train for seven nights. However, as the train follows a fixed itinerary, you will be responsible for your own transportation to/from your points of embarkation/disembarkation, for any hotels you use during the journey, for meals taken while separated from the group, etc. 14What expenses will I have during the trip? 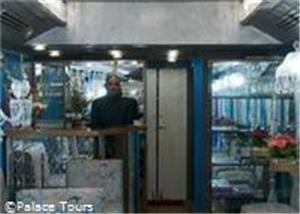 Palace on Wheels is a very inclusive experience, so you will not need to pay for any meals, water/tea/coffee, sightseeing, monument entrances or accommodations. You will incur additional cost if you choose to purchase any wine, alcohol, soft drinks, or juices; laundry services; additional toiletries; camera fees at monuments; sightseeing, transfers, or other services in Delhi; gratuities; and/or souvenirs / items of personal nature. 15Are there any other facilities available on the train? There is a bar, lounge, spa, indoor games and a mailbox for outgoing posts. 16Do I need a Visa for India? Need a Hotel in Delhi? 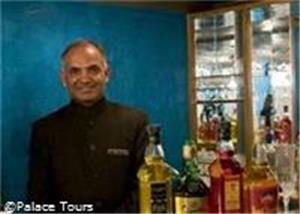 Upgrade your tour to a 9-night package by adding two nights in Delhi!